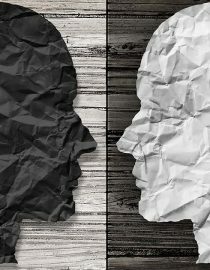 Bipolar 1 Versus Bipolar 2: What’s the Difference Between the Two? However, diagnosis of bipolar disorder can be further broken down various types, such as bipolar 1 and bipolar 2. Unless you have been diagnosed with bipolar disorder or work in the mental health field, you probably don’t realize that there are five different types of bipolar disorder – yes, five. Bipolar 1 disorder is a severe form of bipolar disorder – it involves severe mania and depression. Bipolar 2 disorder is similar to bipolar 1 disorder, but the mania is less severe and is called hypomania. However, the depression may be just as severe. Cyclothymic disorder is characterized by brief periods of hypomania and depressive symptoms. The hypomania and depressive symptoms are not long-lasting, or as severe as in full hypomania or depressive episodes. Mixed features are characterized by the person having multiple symptoms of “opposite mood polarities” occurring simultaneously. Examples may include mania and depression and euphoria and suicidal ideation, and other symptoms may include sleeplessness, racing thoughts, and hopelessness. Rapid-cycling occurs when four or more episodes occur in a 12-month period. It is interesting to note that, “Sometimes called ‘ultra-rapid’ cycling, there is a debate within psychiatry as to whether this phenomenon is a valid or well-established feature in bipolar disorder… Some people also experience changes in polarity from high to low or vice-versa within a single week, or even within a single day, meaning that the full symptom profile that defines distinct, separate episodes may not be present.” This type of bipolar disorder can occur with any type of bipolar disorder and can be a temporary condition. Bipolar 1 is also known as manic-depressive disorder. It is characterized by having at least one manic episode, as well as periods of depression – typically periods where the person is suffering cycles between periods of mania and depression. As we had just mentioned, these periods of mania are followed by depression – and this is why the term “manic depression” was coined. As frightening as bipolar 1 sounds, only 2.5 percent of the US population has bipolar disorder, which equates to about 6 million people. However, anyone can develop bipolar disorder. It does not discriminate – but most people who develop it do so in their teens or 20s, and typically by their 50s. Not to downplay a mental health disorder, but bipolar 2 disorder is typically described as a less severe form of bipolar disorder. Remember those manic episodes that we discussed? They do happen with bipolar 2, but those “up” episodes do not reach full-blown mania. Thus they are called hypomania. After a period of hypomania, depression follows. The hallmark difference between bipolar 1 and bipolar 2 is the presence of either mania or hypomania. Both can be debilitating, but there are some stark differences between mania and hypomania. A sustained mood that is elevated. Feelings of superiority or grandiosity. Not needing a lot of sleep – but not feeling tired. These symptoms must be different from normal behavior when not depressed. It is also important to note that someone experiencing hypomania may note a reduction in their daily functioning, they typically are still able to have some semblance of normalcy in their day-to-day living. So, how do these symptoms differ from mania? In someone experiencing mania, these symptoms may also be present, but on a much larger scale. For example, someone with mania may be completely unable to hold back their racing thoughts and shout something at an inappropriate time, such as in the middle of a funeral. They may miss work due to a spur-of-the-moment decision to take a trip. Mania also includes delusions and hallucinations, while hypomania does not. This can cause someone to believe that they have responsibilities that they do not, such as they are the president. Of mania is severe enough, hospitalization may be required, which is not typically required during a hypomanic episode. Next page: The similarities between bipolar 1 and 2, how bipolar is diagnosed and treatments.